Very true indeed. I have seen you on our scoreboard with same score as i had. Since we both are in the same class you should have been given 5 ninja's! I'm sorry but this is ridiculous. Everyone has got that maintenance chest, whether they were affected by the problem or not. How about compenstating the ones who were affected by it. My team could not play for more than 15 hours. Some could not finish their pro, a paid ticket waisted! I feel screwed over by flare once more. And i believe many many players/alliances do! Same here for about 11 hours now. It is very inconvenient. The entire alliance cannot get into the game because it cannot connect to server. Send a ticket already...but i have 2 tickets still open. It appears Flare doesn't take their players/customers very serious nowadays.. the one problem after another. Where is this going? I am in war and i attack someone. After clicking to get 3 wolves i cannot ask anything no more. I click on any of my troops.... nothing.. i click on my spells... nothing. I want to pause.. nothing. But i am able to walk around. Anyone experience this problem? It s.cks.. last 2 conquest messed up because of lags and lost connection. And now this.. war ruined. No follow up on tickets/requests. After 2 days i get an email with questions, i answer them and then i hear nothing.. True that. Same here. Game is unplayable all day. Same here. Game freezes all the time. Reinstalled game but nothing works. Cannot even do my attacks. This s...s! Hi kings and queens, Tomorrow is the ninja event. We still have some spots left, you're welkom to help in ninja? 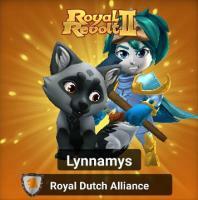 Hi all, I am Lynnamys and i am a general at Royal Dutch Alliance. We're seeking new active members to join us. We are a lvl 76 alliance and we strive to reach lvl 80. We speak English and Dutch in our chat. 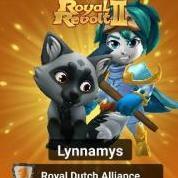 We consist mostly of Dutch members and a few foreign members. What we ask of you is that you are active in war, ninja, conquest and donate every day. When you're not able to play because of holiday just let us know. Players who are at least lvl 100 and 500k donation will be accepted. When you are a bit below, please contact Lynnamys or another general and we might be able to come to an arrangement. Happy gaming? True, we also only got 2 items out of these chest. No working boosts. And i have to admit it is a very disapointing reward for the 8 sleepless days. And only to start again in 2 wks.